WowApp claims it is a platform where you can earn, share, and do good at the same time. But is WowApp a scam or is it really a legit way to earn online? I have joined to test it out myself and see what it is all about. Let me be honest with you right away – it can be a little overwhelming and confusing at first. In this WowApp review, I will, therefore, give you an inside look so you can easily see exactly what it offers and how to use it. Then it will be easy for you to see if it will be worth your time or not. Disclosure: Some articles on PaidFromSurveys.com contain affiliate/sponsored links. Click for more info. What is WowApp and what does it offer? WowApp has a different approach than many other earning platforms. The idea behind it came because of the increasing income inequality in the world. The founder wanted to create a platform with an economy where people could earn for what they are already doing online so the revenue what not only go to the big companies. It was launched in 2015 after around 5 years of development, so a lot of thought and effort has been put into creating the platform. On the website you can see it says the founder is Robin Wow – this is of course just an alias and refers to Robin Hood who was taking from the rich and giving to the poor. So there is definitely an interesting idea behind WowApp. But how can you then earn by using it and how does it work? It has quite a lot of options and that is why, as I mentioned in the intro, it can be a little overwhelming at first. But below I will go over the opportunities it has so you quickly can get an overview and see if it is for you or not. 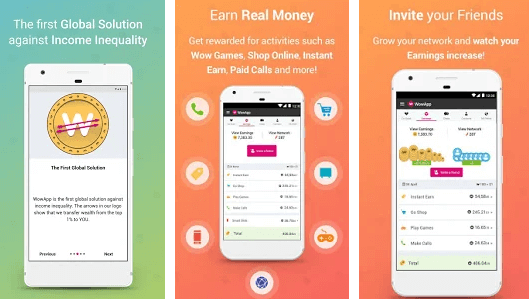 In the “Instant Earn” section of WowApp, you will find several ways to earn. 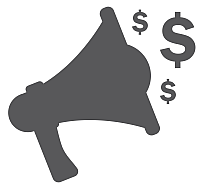 It is for example here you can find paid surveys, where you can take surveys and get paid to share your opinion. The rewards you get for taking surveys are more or less the same as on other survey sites, and it is definitely a way of earning that is worth checking out. It offers surveys through third-party providers, which means it has a decent amount of surveys available and often several per day. Like on all other survey sites, you just have to be aware that you will not qualify for all the surveys, so do not give up if there are some you do not qualify for – that happens to all of us. Some of the options you can find in the “Earn Instant” section. In the Instant Earn section, you can also watch videos and get paid to watch these. Usually, very short videos and compared to many other sites that offer videos as a way to earn it is easier on WowApp. You just have to watch one video, and then you will get the earnings into your WowApp account right away. This will not give you huge earnings but can be a way to earn a little extra. In the same section, you also find offer walls. This is a place where you can get paid to take paid offers. This can, for example, be to sign up for contests, download apps, and more. So the Instant Earn section of WowApp has some pretty good opportunities to earn. But the platform also offers several other options, as I will go over below. WowApp has a whole section where you can find links to thousands of online stores. If you use one of these links and shop in one of the stores, you will get cash back into your WowApp account. You can get cash back through thousands of online stores. Usually, it is somewhere between 2%-10% you will get back. What is pretty cool about this option on WowApp is that is has A LOT of shops you can get cash back from, and there are stores you can use from all over the world. It is, of course, not directly a way to earn, as you have to spend money to get cash back. But most of us are regularly shopping online anyway, so why not then get some cash back and this way save some money. I am, for example, at the moment looking at hotels through booking.com for a holiday I and my wife are going on. If I use the link on WowApp, I will get 3% cash back – I would book anyway, so why not get some cash back, right? So the shopping section of WowApp is definitely worth checking out if you ever buy anything online. There is a big games section on WowApp. Here you can find small online games in more or less any category you can play for free. WowApp gives access to many online games. You earn WowCoins by playing. You will not earn huge rewards like this, but you will, of course, earn more the more you play. It should not be something you, in my opinion, should do just to earn, as WowApp then has options that pay better. But if you like to play games, then why not earn at the same time and do it through WowApp? The WowApp Smart Slide is an option you can use on your phone. You can turn the Smart Slide on, and then WowApp notifications and news will be available on your lockscreen. When you then unlock your screen, you will earn. This does not take much effort so can be an easy way to earn a little extra even though it will of course not be much. But it can still be worth using, as it does not really take any effort. According to WowApp itself, it consumes very little battery power to have this function turned on, so it should not affect the battery power of your phone. WowApp has an extension for Chrome and Firefox browsers you can install. The WowApp browser extension can come in handy. This browser extension makes it possible to get easy access to news and surveys while surfing online on your computer and earn this way. The most clever thing about the browser extension is the Smart Shopper function. It lets you know whenever you are on a website or webshop if it is a shop that offers cashback through WowApp. This is very convenient as you then do not have to remember to go to the WowApp and check if the shop you want to use has a cashback offer through WowApp every time you want to shop online. You will just automatically be told – very clever and a very handy function if you ever shop online. WowApp has a call and chat function. You earn simply by using these and you can use it to call or chat with other members. The call function is very much like Skype where you can call other WowApp users completely for free within the app, or you can get credits and call landlines or mobiles all over the world. If you ever need to make international calls, this can be a great option and a great alternative to Skype and other big call services. The prices vary from country to country. You will get cash back if you make calls. The cool thing about using WowApp to make calls is that you will actually earn every time you use credit contrary to other similar call services. You will get 10% of whatever you spend on calling into your WowApp account. If you ever read any kind of news online, WowApp offers a way to do this where you will earn at the same time. 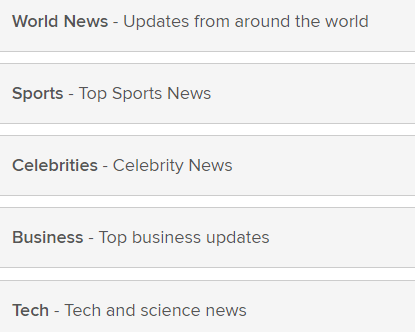 It has a news section where you can choose which countries you want news from, from which categories, from which providers, and more. The News section lets you customize a news feed. This will create a customized news feed for you and you can access this both on a desktop, tablet, and mobile. The concept of WowApp is based on sharing the income that is generated online. A part of it is therefore also that you can invite friends to participate. If any of your friends join, you will earn a percentage whenever they earn as well. This will not affect what they earn but is an incentive for you to share WowApp with others. In fact, you need an invitation to join. You cannot join without being connected to another person that is already a user. I have such an invitation, as I am a member myself, so you are very welcome to use my invitation link to join by clicking the link below. As you can see, WowApp has quite a lot of options. But you, of course, also need to know how you will then get paid and how you are able to get your earnings out. The payment methods on WowApp has both positive and negative aspects, in my opinion. Whenever you have an activity with WowApp, you earn WowCoins. One WowCoin is worth $0.01. One thing I really like about WowApp is that when you earn, you will not only earn for yourself. You will also earn for a charity automatically. So every time you earn for yourself, you will also earn for a charity, and you can choose the charities yourself and there are many to choose from. 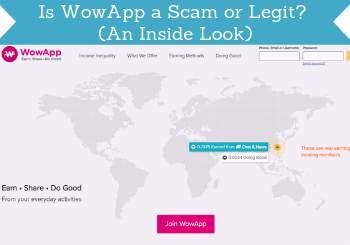 This is where the slogan “Earn – Share – Do Good” comes from, which is the slogan of WowApp. Your own earnings can then be paid out in several ways. You can choose to get the money out in cash to your credit card, through PayPal, or directly into your bank account. Or you can choose to donate your own earnings to charity as well or use it for mobile credit. So the payout methods on WowApp are really good, in my opinion. I especially like that they make it easy to get your earnings through PayPal or directly into your bank account so there are several ways to get your earnings in cash. There is, however, one thing about the payout methods I do not really like. That is the fees associated with it. If you, for example, want to get paid through PayPal, there is a $1 transaction fee + 8%. There are other reward sites where you have to pay a small PayPal fee of around 2-3% or a small transaction fee so that is quite normal. But 8% fee is the highest I have seen and a little too high, in my opinion. This does not mean it will not be worth it, as WowApp still has some great earning opportunities. You just need to be aware of this so you do not get surprised about it when you want to cash out. So how much is it then possible to make by using WowApp? This depends on a lot of things. It has a lot of opportunities, but it, first of all, depends how many of these options you want to use and how much time you want to spend on it. If you use most of the options like regularly taking surveys, take some offers, use it to read news, use the cashback option, and more, you can get some nice extra money. Just be aware that it is not a way to make a full-time income or to get rich. But if you do it to earn some extra cash and get some earnings, it can definitely help you with this. Can you use it both on mobile and desktop? As the name suggests, WowApp, is obviously available on mobile and has its own app you can download. The WowApp for phones makes it easy to use on the go. The app makes it easy to use on the go and whenever you want to during the day. Just make sure to download the official version of the app. There seem to be several people that have created apps with similar names to try to hijack some of the downloads, so just be aware of this. But you cannot only use it on mobile. WowApp also has an app/software for desktop you can download. You will also earn by using this. And finally, you can also use it directly on the website. So there are plenty of ways to use WowApp and it works on more or less all devices one way or another. Just be aware that some of the options are only available on certain devices. The surveys and videos are, for example, only accessible through the phone app. So if you use a device and one of the earning options is not available, just try it on another device. A really great thing about WowApp is that it is available worldwide, so you can join no matter where you live. This, of course, makes sense since it says it wants to help deal with income inequality so it needs to be available worldwide, and luckily it is. Also, WowApp is available in many languages so even if English is not your first language, you will easily be able to use the platform, which makes it very user-friendly. 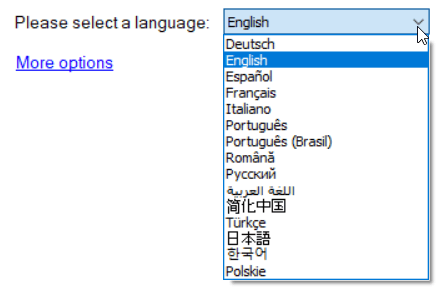 The languages WowApp is available in. The opportunities to earn on, for example, surveys might vary from country to country, but overall WowApp has good options for most countries. If you should need support when using WowApp, you have several options. You can submit a support ticket on the website, or you can send a message through the official Facebook page. From what I can see on the Facebook page, the support is very fast at getting back to people that comment. This is always a good sign and shows the support is paying attention and willing to help, which is a big plus when joining an online earning platform like this. No doubt that WowApp is legit and not a scam. You can earn by using the platform, and you can get paid out in legit ways. This does, however, not necessarily mean it will be the right platform for you. So let’s finish by summing up the pros and cons so you can get a better overview before deciding if you want to join or not. Overall, WowApp is, in my opinion, a platform with a lot of potential and it is built on great principles. You just need to be aware when you first join, it might be a little confusing due to all the options it has. I, however, hope this review has helped you get an overview and get started easily if you join. It is a site that has good opportunities worldwide, which is rare, and it has great payout methods so definitely worth giving a try. It is easy to join WowApp. Just be aware that you have to join through an invitation, which is a bit unusual. But I have such an invitation, so you can join through the link below. If you have any comments, questions, or have any experiences with WowApp yourself, I would love to hear from you in a comment below. WowApp is a worldwide platform that has several ways to earn. Many of the earning options are by doing things most of us do online every day anyway like chatting, calling, reading news, shopping online, and more. You can also earn by taking surveys, watching videos, taking offers, and more. Overall an interesting app that can be used on all devices. It will not make you rich, but it can make you some nice extra cash and you will do good at the same time, as a percentage of WowApp’s revenue goes to charity.